Perhaps this isn't your first dip in the foundation paper piecing pond, you're more than a beginner, but sometimes a tough angle looms up and you put it off because it's a little intimidating. Or maybe you're using scraps of some precious hoarded fabric and you need to make each little piece fit. This technique utilizes smaller pieces of fabric, so the angles will need to be just so. 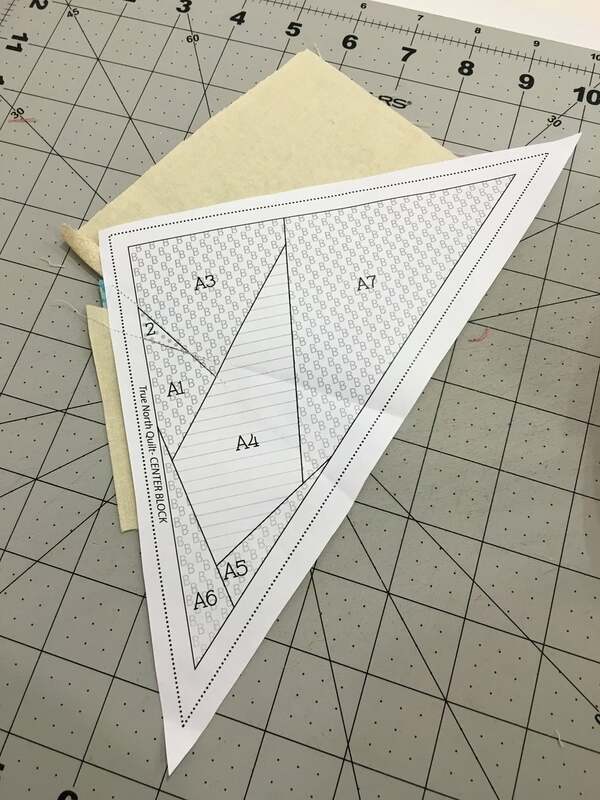 This method will also come in handy when fussy cutting small designs and pieces for your foundation paper piecing. If you're unsure about foundation paper piecing you can check out a beginner course here, using my Forest Abstractions - The Bunny pattern. You can see piece A4 has an interesting angled shape and I have the perfect fabric to fit there. Pieces A1, A2, and A3 are already pieced into place. I want the Catelope to fit right in the center of the A4 diamond shape with the Catelope antlers positioned into the wider section of A4. To prepare my templates for piecing this angle perfectly, I first trim the seam allowances of the previously sewn fabric from along the seam I want to sew next. In this case that seam is the line between the A4 section and the previously pieced A1 & A3. With RIGHT SIDES DOWN against the cutting mat, use any thin cardboard along the seam line to fold a crease in the paper. I use a paint swatch. Fold the paper back along the line to get a good crease. Trim 1/4" past the fold in the paper, creating your seam allowance. I use an Add-A-Quarter ruler to quickly get a perfect 1/4" every time, but any quilting ruler with 1/4" markings will do. Take a minute to think about this. Trimming the seam allowance in advance shows you exactly where your next piece will need to line up and prepares you to get that A4 piece perfectly fit for sewing. I have moved the desired A4 fabric under the paper. The fabric is RIGHT SIDE DOWN towards the cutting mat. This will be the fabric's final home. It fits here and the right side is facing down like all its neighbors. If you are worried about the fabric shifting, this is a good time to pin your A4 fabric to the paper. You will be removing the pin prior to sewing. Hold the A4 fabric and foundation paper firmly in place and fold the rest of the foundation back again along the seam line. Repeat the process of trimming 1/4" past the fold in the paper. The seam allowance you created in the previous section of steps now perfectly matches the seam allowance you just cut. Let's stop to take a quick minute to think about this again. You have now cut both of your seam allowances and your angle is perfect and ready to seam in. There is one more step in making sure the angle lands exactly where you want it to when you bring the fabric to the correct side of the paper to sew it. Use a fabric marking tool or a pin to mark the exact spot the two fabrics meet up at the top and bottom. In this case, the bottom points are coincidentally matched up. Bring the A4 fabric back to the top, still RIGHT SIDE DOWN (unpin from the paper, if you did in a prior step). Match the position of the pin or marks to ensure the fabric is still in the desired position. Holding everything carefully in place (this is a good time to put a pin back into these fabrics through the paper to hold them in place), unfold your paper back out. Carefully turn the whole piece over and sew along the seam line. Fold the fabric out and roll or press the seam on your perfectly placed piece! Did it work for you? Let us know in the comments!